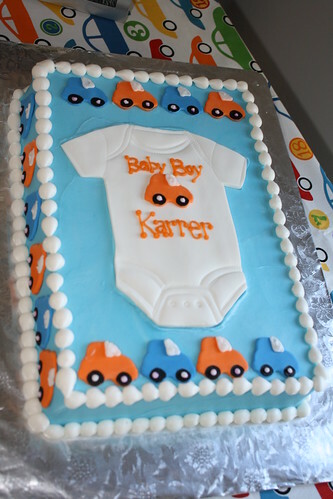 I'll bet that you are curious about what I made for Baby Boy Karrer for his shower gift! 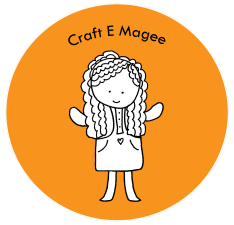 Staying true to my name, Craft E Magee, all of the gifts I gave him were handmade! 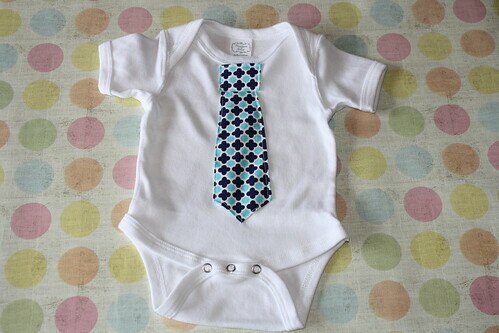 I was able to discern from my cousin-in-law's pinterest page that she really hoped to get a tie onesie, so I stitched one up for her. 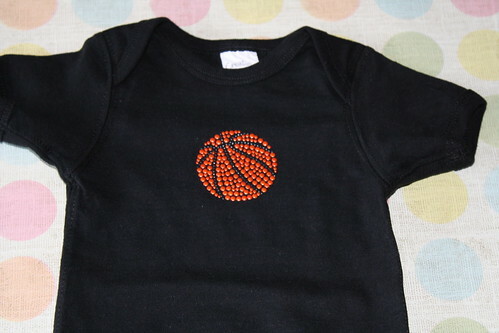 I also used some iron-on letters and a basketball applique to make Baby W a basketball "jersey," since my cousin, aside from being a mechanic, is also a basketball player! 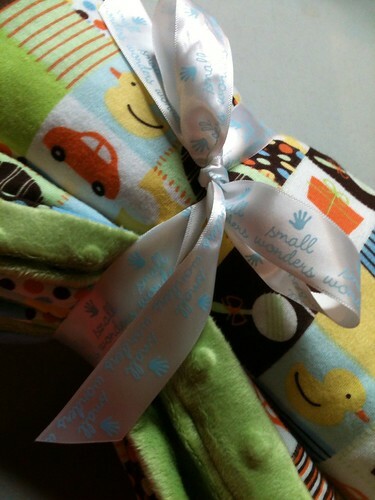 Last, but not least, I made him a snuggly soft baby blanket with bubble fleece and knit fabrics. The knit fabric was covered with bright orange cars, yellow rubber duckies, and lime green rattles. 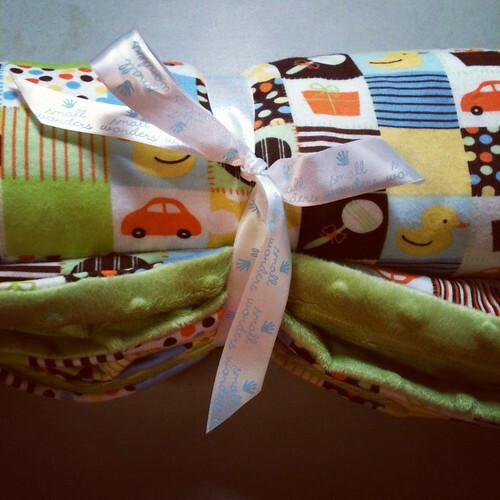 I thought the lime green bubble fleece fabric was the perfect backing for this precious blankie. Here it is all wrapped up and ready to go. I love making handmade gifts! Especially for sweet little babies! My cousin and his wife are having a baby! 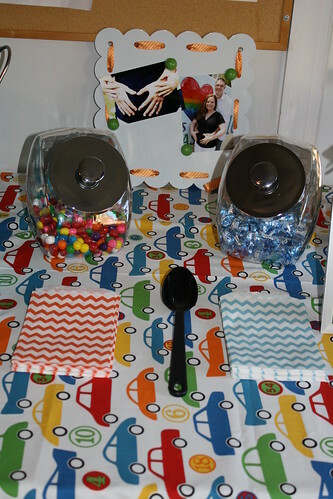 I knew when I got involved in planning the baby shower that it had to have a car theme! 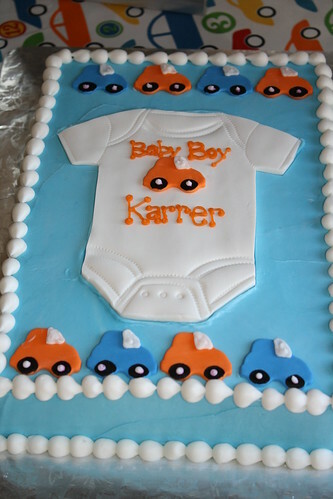 Baby W's room has a car theme, his daddy is a mechanic, and last but not least, they're last name is Karrer (pronounced: car)! 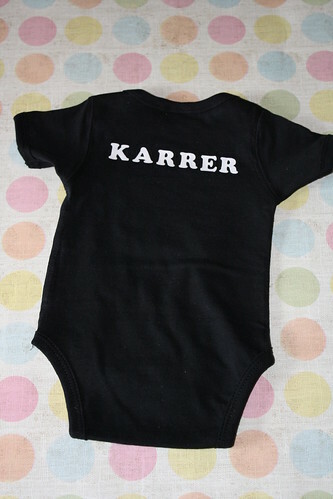 Last night was the big party, to welcome a "Brand New Karrer" into the family. Everything went well and Baby W danced in his Mommy's belly over all the excitement. I took lots of pictures, so enjoy! The dessert table set up was my main priority. We had jars with candy, and lots of other sweets! 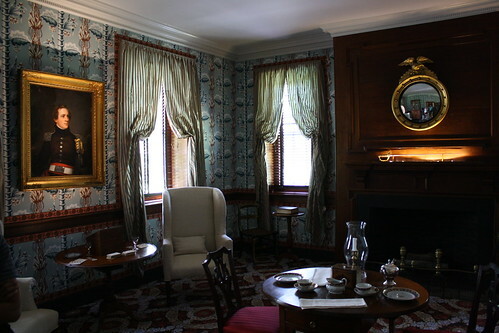 The car fabric tablecloth is a great Alexander Henry print from one of my favorite etsy sellers. It really added a lot to the orange, blue, and yellow accent colors. 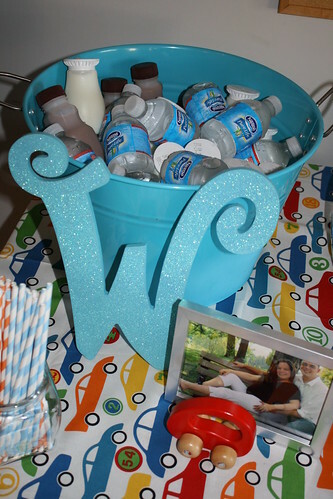 I envisioned little milk and water bottles to go with the orange and blue paper party straws, and it turned out really cute. Luckily I had the blue tub from my nephew's 4th birthday party. The "W" letter came from Hobby Lobby and the Goku car was from ebay. These candy jars were also from my nephew's 4th birthday, but the Chevron candy bags (and straws) were a sweet find from etsy. I made cake pops and candy coated pretzels, which are always winners at parties. 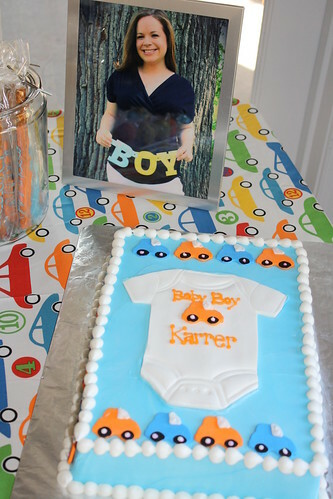 The wonderfully cute cake was created by Melissa from Louisvillicious Cakes and Desserts, LLC. 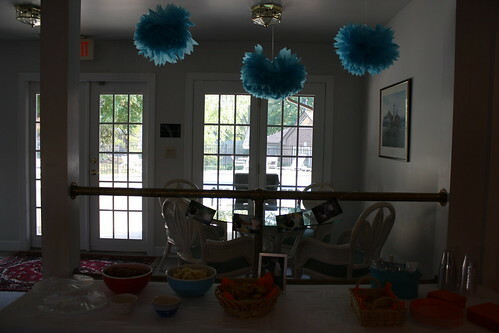 It's dark in the photo, but the tissue paper puffs made it to the party! 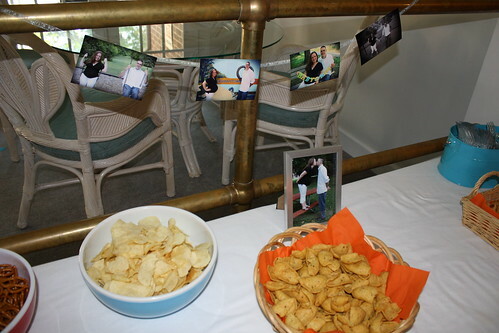 I had a photo session with my cousin and his wife a week before the baby shower, so I was able to string some photos and display them around as decorations. I also framed some of my favorites for them to keep. Isn't the mom-to-be just adorable?! Tomorrow is my cousin-in-law's baby shower! I am very excited to be hosting the party with my Aunts. 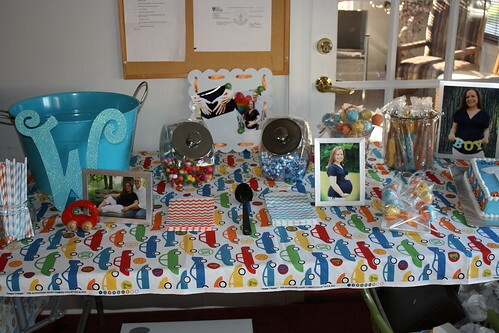 I love planning parties and enjoy coming up with a theme to tie everything together. 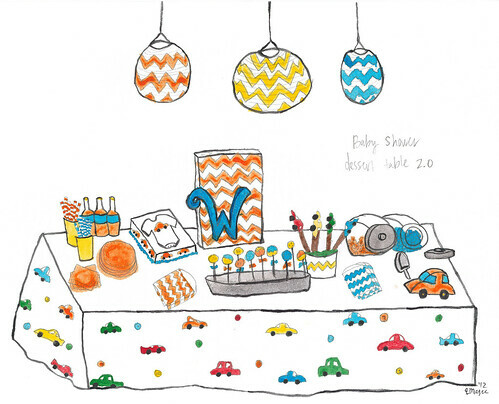 To go along with the invitation for the baby shower, I decided to sketch out a theme for the party. 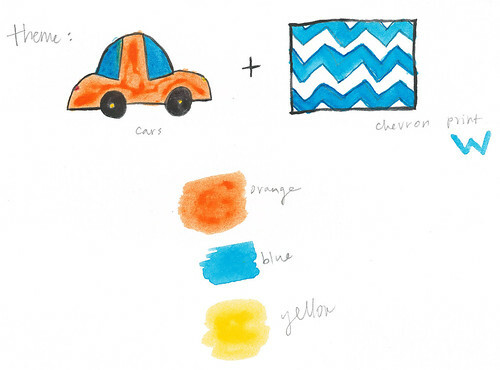 I liked the idea of orange cars and chevrons in blue and white, with yellow as an accent color. The baby's first name will begin with a "W," so I liked that the chevrons were like the letter "w" strung together in a repeating pattern. 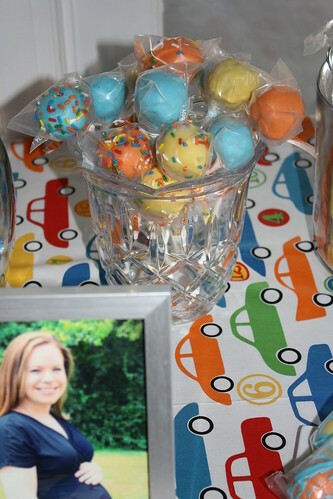 I assumed that it would be simple to find some chevron printed fabric to use as a tablecloth for the dessert table. 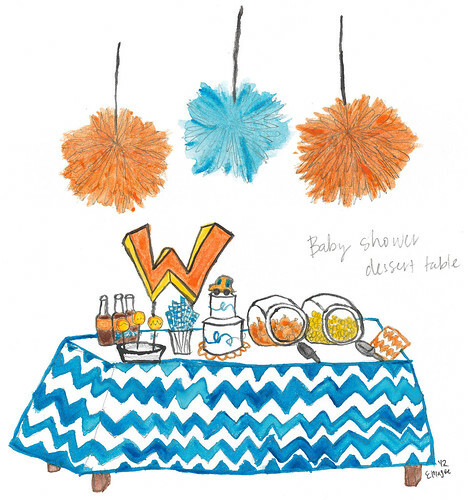 I liked the idea of using tissue paper decorations in blue and orange, and having the table decked out with striped paper straws for the sodas, a tiered cake, candy jars, and some cake pops. 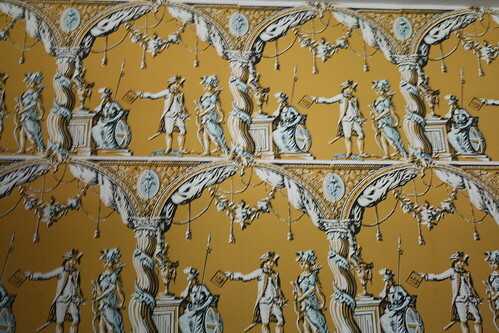 After being unable to find the fabric in the color that I wanted, I ended up buying some great race car fabric online. 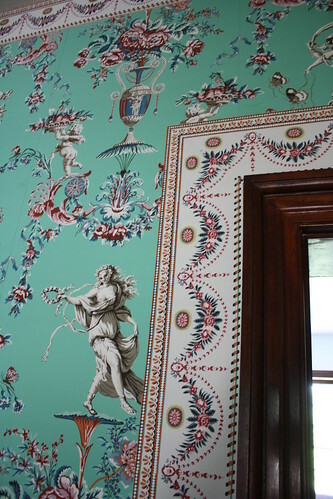 The fabric brings in 2 other primary colors: red and green. I am still sticking with mostly blue, orange, and yellow, but I love how this fabric will make tomorrow's party theme really mesh. 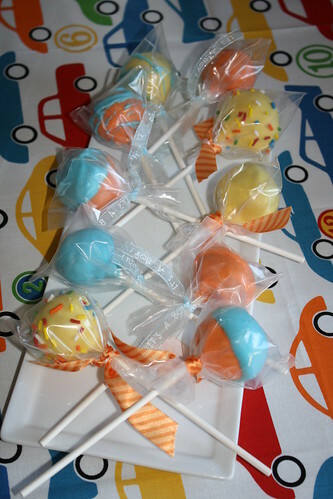 I plan to have cake pops made to look like baby rattles, pretzel sticks with candy melt cars molded onto them, a sheet cake with orange cars, candy jars filled with colorful treats, chevron candy bags, blue and orange paper straws with either milk or soda, and more! 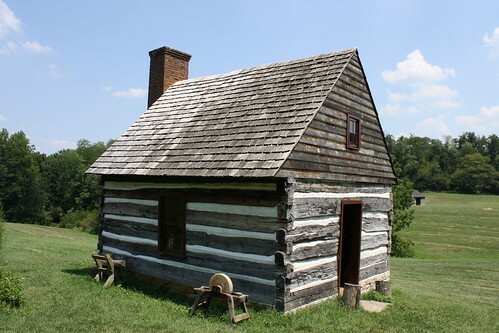 Stay tuned for the after photos, when all of the planning comes together! 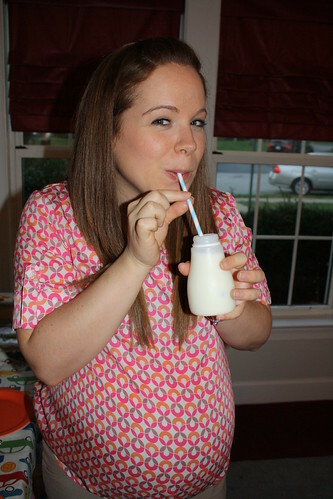 I am very excited to be planning a baby shower this month for my cousin's wife, who is due in September! It is the first child for them both, and they are going to be awesome parents. 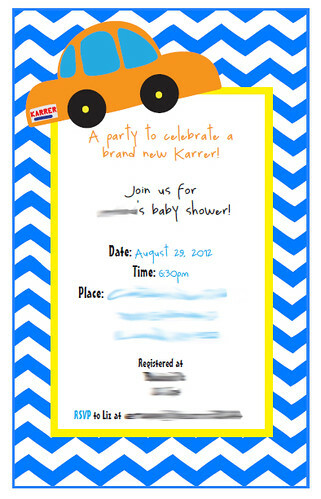 Here is the invitation that I created for the car and chevron themed shower! I have big plans for the party, but I don't want to share too much in case she is reading! Stay tuned. It's that time of the year when the wee ones head back to school! 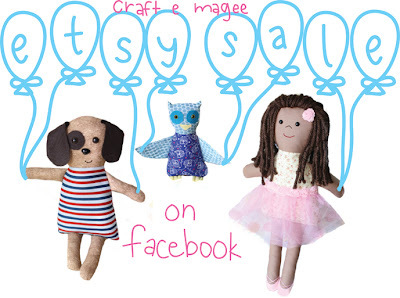 Give them the joy of a Craft E Magee toy, now 5% off in the etsy store when you buy through facebook! 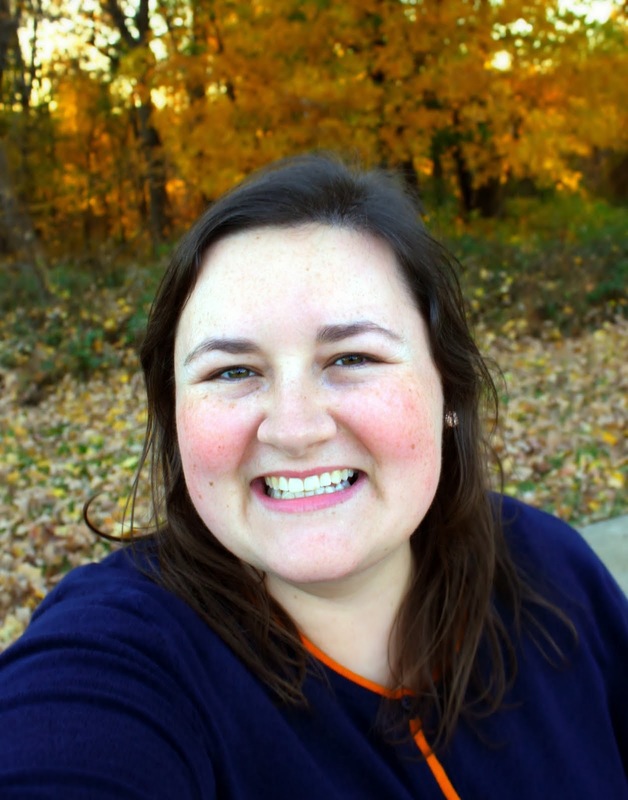 I have had a hectic summer that has kept me away from blogging, but I am sad to see summer go, for many reasons, but mostly because I am losing a pal! My little nephew C is growing up. 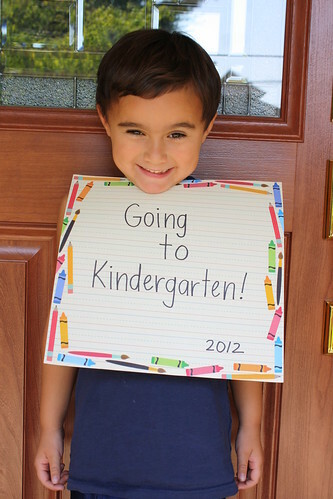 He turned 5 this summer and starts kindergarten tomorrow! We have had an amazing journey since he was born, and although I know we will continue to have fun, it is not without some sadness that we mark this new chapter. Gone will be the workday visits at lunch. 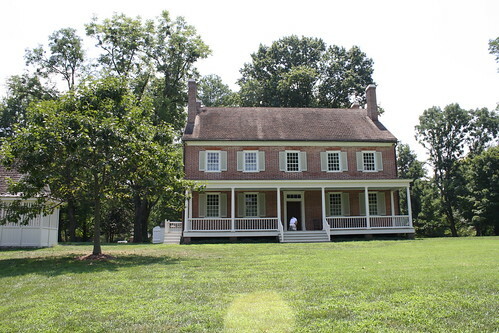 Gone are college days when we went to museums and parks and stores and movies after class. I am reluctant to relegate C time to weekends only. 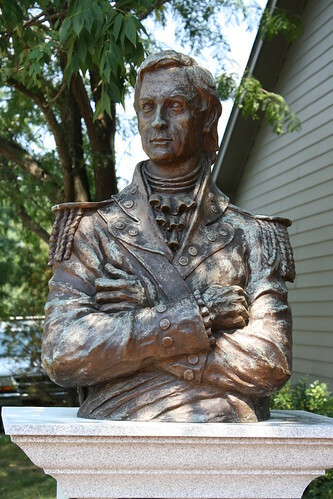 I am sure this change is harder for me than it is for him! Today we decided to have a "last hoorah" and he got his choice of places to visit. 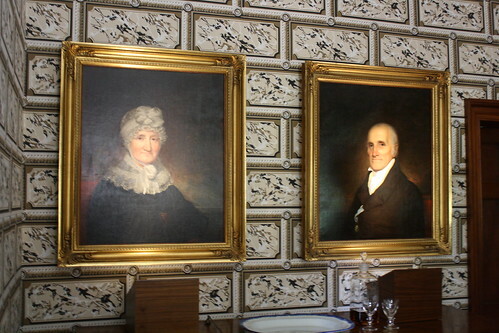 He picked the historic home Locust Grove that used to belong to the Clark-Croghan family. It was a very adult choice! 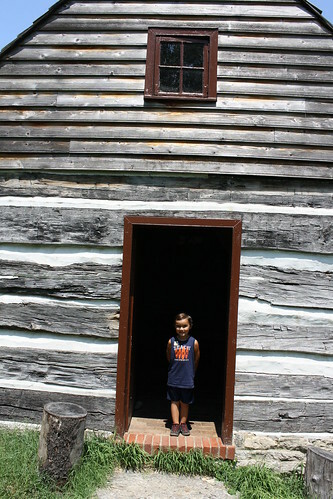 It surprised me, but we had plenty of fun!